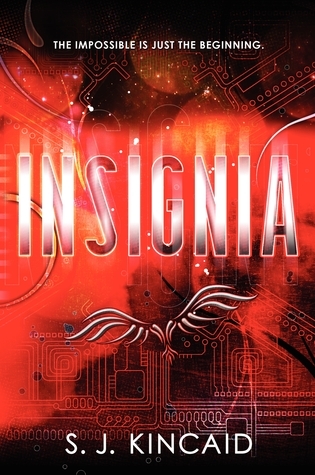 Insignia (Insignia #1) by S.J. Kincaid. Audience/Genre : Young Adult/ Sci-Fi, Futuristic. Publication : July 10th 2012 by Katherine Tegen Books (Harper Teen). God, it's been so long since I read a book that had me tearing through the pages. A million zillion thanks to Harper Teen for letting me read this in advance. Insignia's set in the future, it's World War Three and everything's different. Tom, our protagonist, is a gangly, pimply teenager whose life is heading nowhere since school's not really been in the picture for a while and most of the time, he's gambling (illegally) because that's the only thing his father's taught him. However, it's a different kind of gambling - Tom's a gamer. There's only one thing Tom fears ; that he'd end up like his father, heading no where in life. So when he's given the opportunity of a lifetime, he jumps at it. Tom's been offered a chance to join the Pentagonal Spire, a military academy that accepts and trains only the best teenagers from around the world to fight in the war. Insignia is crazy, in an omg-freaking-amazing kind of way. I don't even know where to begin - the world building, characters, plot? Seriously, this book is all kinds of awesome! Kincaid's world is addictive and extremely sophisticated. It's almost impossible to find a flaw with this book because the story's so well thought. The characters are incredible and some of them, endearing. I loved all of Tom's friends! Tom's world is, for lack of a better word, just cool and I wanted to so badly be a part of it. The plot's so unique and riveting, you won't be able to put this book down. I have to add this though - there were times when I found it it all too much to absorb, it was an information overload but eventually, I caught up. Insignia has pre-order written all over it. Gamers and tech geeks, this one's for us! Read it! wow, now i am cursing at myself for giving this book for my sister to review (you know we divide our review pile). it seems like you LOVED IT! and i don't usually feel like i WANT to be a part of the book, so yea, excited for this one!! It was so different from the usual YA books. I hope Fara likes it and oh oh, also let me know what you think when you read it!